TheHomeRejuvenationBlog recently announced its 10 Most Influential Design Bloggers, as voted on by bloggers around the world! Looks like a couple of my favorite design blogs are missing from this list, but none-the-less we offer a happy congratulations to all winners! GREAT JOB! While you're sipping Earl Grey tea and glancing through winning blogs, don't forget to check back for more info on our upcoming contest where one lucky winner will get to walk away with the Dabbieri hand-knotted rug of his or her choice. I promise to have more info in the next week! I know I should keep this under wraps, but it's just too exciting. Word on the street: at the end of November, Dabbieri will be running a contest of sorts and one lucky winner will get to walk away with the Dabbieri hand-knotted rug of his or her choice. Win the rug of your choice. By the way, I should mention, our new rugs are glamorous: g-l-a-m-o-r-o-u-s. They're beautifully made, gorgeously designed, hand-knotted Tibetan area rugs. Designs made especially and only for Dabbieri. Just between you and me, the 8x10 Dabbieri rug the lucky someone wins, retails anywhere from $7,000 to $9,000. I wish I could win the Dabbieri rug featured above (click on the thumbnail to view the full Dabbieri Rug style Sanctuary, color Evergreen). It's my personal favorite. Reminds me of the time I spent in Namibia, Africa last year. I'll leak some more information on the contest in the next couple of weeks. Emily Morrow, Director of Color, Style and Design for Shaw Industries recently shared her thoughts on 2007/2008 Color, Style and Design Trends. The details were so useful and interesting, I found myself vigorously trying to jot down every word she spoke! Enjoy! “We’re seeing variations of rich shades of green again and teal — but this time, think of peacock feathers and all their lustrous, rich, saturated colors. Yellow-based greens will continue very strongly. Spearmint, or blue-based green, is up and coming.” Greens are staying strong because of their link to environmental awareness. Versatile, almost neutral, greens can be subtle and sophisticated or intense and playful. The newest variation is “toxic” shocking green, equal parts green and yellow. “Navy, true blue, and the water blues are important. Nautical, blue-and-white, bold stripes are very strong.” Soft shades of aqua reminiscent of the “water” colors which have been trending strongly for the past two or three years still remain as important in our blue family. Blues will become more diverse, influencing purples and greens; and blue-greens are seen in unusual combinations with other colors (rich browns, yellow-greens, and vivid red-oranges). “Chinese red is being used as a contrast against satiny, lacquered ebony surfaces of furnishings.” Red is always a “classic” – the significant aspect of red is whether it’s influenced by blue or yellow. Today’s Chinese red is definitely a rich “red-orange," but look out for “Venetian Red” which is a purer red bordering on the blue side. The trend catalyst for the color is the “Baroque” style which is permeating the marketplace. Bright corals are strong, while mid-value pinks are beginning to decline in the next year. When treated with a specialty finish, reds can take on an effervescent quality. “Pinks are going towards rose, moving away from the bubble gum pink.” One must acknowledge that the Evelyn Lauder Breast Cancer Awareness “Pink Ribbon” campaign has created a tidal wave of home and fashion products in the pink family. “New oranges are appearing — some are muddied, burnished and look aged or oxidized; there’s more patina and surface interest. This color family has worked its way into automotives and appliances, as well as upholstery and drapery fabric, paint and fashion.” Oranges — muddier and brighter, depending on the context. Specialty finishes can create a rich oxidized patina or the appearance of molten lava. Either pure, funky, and high-tech or antique and burnished. Subtle yellow-golds are appearing in gilded finishes, burnished leather, or precious metals. “We’re seeing all shades — mocha, cinnamon, chocolate, coffee.” Brown, a sustaining color trend in fashion and the home has become increasingly respected and dominant. Dark and medium chocolates, ranging from coffee bean to latte, lustrous or mineralized shades of “just-tilled earth”; paired with vibrant, unexpected colors. Warm and elegant when used with aged gold or dramatic and daring with magenta or orange. Becoming darker, more saturated. Now being infused with a blush of color (sometimes relating to golden skin tones), creating the effect of more personalized options for consumers. Neutrals in all constructions are moving darker - taupes, tobaccos, anything reminiscent of leather, travertine, stacked stone, slate or granites like “Baltic Brown” or “African Tapestry”. Green Rules: Look for softer, more botanical greens inspired by nature. Nature Blues: The color of the sky, the color of water, true blues from nature will be everywhere. Rich, Ethnic Accents: Add punch to more neutral settings with accent colors from a rich mix of countries and cultures. Deep, rich ethnic reds and warm, glowing oranges are the “hot” colors for 2008. Jennifer Dumoulin's design philosophy has evolved over her 17 years in the industry. She was kind enough to sit down with us and share her views on current and future changes in the interior design industry and key ingredients to a designer's success. Dabbieri: Where do most of your clients come from? JD: Most of my new work comes from referrals from existing clients. My future focus will be on promoting myself through targeted media relations activities. Ninety percent of my work is residential and the other ten percent is commercial. Dabbieri: How would you describe your design philosophy? environment that engages all of the senses, and the only way I can design is to listen closely to my clients. Dabbieri: How do you approach an initial design meeting with your client? JD: I look at the dynamic of the client and what the function of the space or spaces will be. Listening to the client is key as I try to draw out what the client’s “mojo” is – what is their style, what are their preferences, what key pieces are important to them in the home. I’ve learned it’s so critical to be sensitive to favored objects in the home. Dabbieri: What’s the biggest change you see in the design industry and in the home? JD: The Internet has definitely changed the design industry with clients able to quickly access items from all around the world. The room that has changed the most in my opinion (and that I’m most excited about) is the expansion of the kitchen. It’s the gathering place in the home and it truly is the hub. I’ve noticed the increasing openness of space and the tearing down of the walls to incorporate a smoother flow from each room with the kitchen. Dabbieri: What’s the one thing you’d like to do differently for 2007? JD: As a designer, I often underestimate my worth and value, as I’ve heard many other designers say as well, and if I could improve on one thing I would bill out my time more accurately to the client so that I’m truly paid for the work that I do. Dabbieri: What is the key ingredient to your success? the highest level of service. It simply makes business much easier – and allows me to deliver the best to my clients. Jennifer Dumoulin is a 17-year design industry veteran and won first runner-up in International Design Guild's 2006 Designer Showcase Awards. 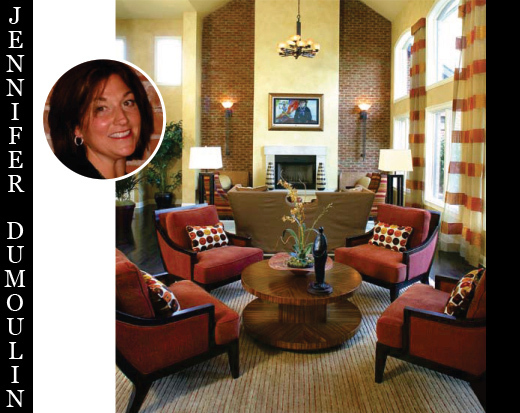 Materials used in Jennifer’s award winning entry are from The Rug Gallery in Cincinnati, Ohio. Jennifer also served as guest speaker at the recent Premier Professional Program "Emerging Design Trends" webinar. Are you a fabulous designer? If you'd like to be featured as a Designer In The Spotlight, please email us your contact information along with 400 words or less on your own interior design philosophy. Please don't forget to include image(s) of your most creative interior designs with a list of floor covering products used.